The Terrific Tuesday Tutoring Club meets every Tuesday after school for an hour from October to May. Volunteer tutors from the community are matched with a student and utilize a variety of resources to reinforce Language Arts standards for their student’s grade level. 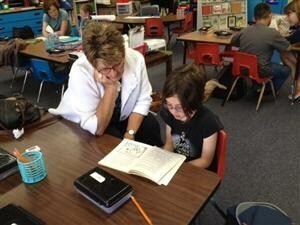 This one-to-one learning environment has proven to be extremely beneficial for our students. Former attendees have made significant gains in reading fluency, comprehension, vocabulary strategies, and written conventions. More importantly, our students form strong bonds with their tutors who serve as mentors and role models for the year. 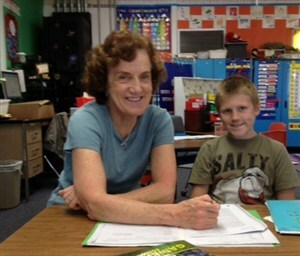 Many of our tutors are retired teachers, principals, and superintendents. 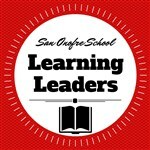 They graciously give their gift of time and energy to help San Onofre students have greater success in the classroom. Students are selected for this club through their teacher’s recommendation. Teachers are asked to recommend students whose scores on the Language Arts California State Standards test fall in the high basic range. Students selected for the Tuesday Tutoring Club are expected to attend every session for the full 7 months. Students in grades 2-3 are grouped together in Room 21 and students in grades 4-5 work in Room 38. The Terrific Tuesday Tutoring sessions are not a homework club. Students use supplemental curriculum such as 6 Minute Solution, Standards Plus, and Read Naturally. Tutors are trained to use these materials and follow a pacing guide.